2015 is about to be a big year for the Cleveland music scene, and The Cosign is right in the middle of it. The Cosign is a coalition of DJs and taste makers from Cleveland: The Good Guys, DJ KY, Tropikana, DJ EV, Big Heff, DJ Ryan Wolf, DJ KNyce and DJ Corey Grand. 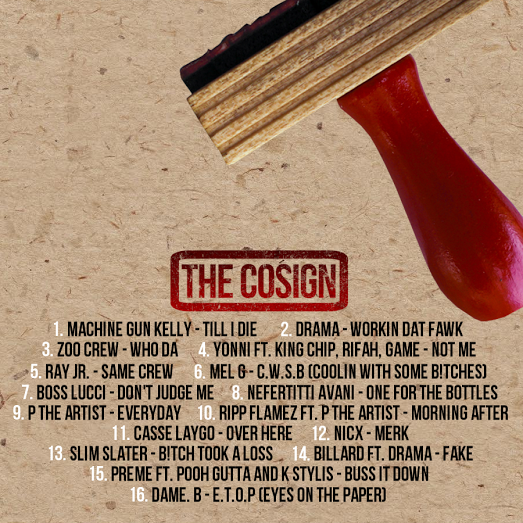 The Cosign 2 Mixtape is a sign of all the great things to come. From hits by Ray Jr. and MGK, to newer names like P The Artist and Casse Laygo, there’s something for everybody. The Cosign 2 Features “Same Crew” by Ray Jr. Follow @LiveMixtapes, @DJStephFloss, @DJKNyce, @DJEV, @8081Meel, @Tropikana,@DJRyanWolf, @DJKY, @BigHeff, @DJCoreyGrand & @ImFromCLE!